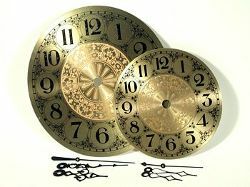 These 7" diameter metal clock dials have a spun brass finish, Arabic numerals and classic European design. Also includes a set of three black clock hands and complete instructions. These faces can be foiled and soldered into any stained glass clock project to add a touch of elegance! 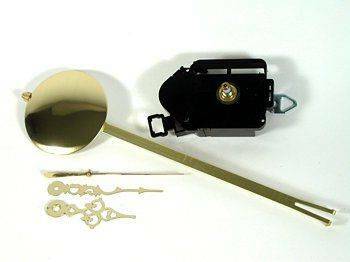 Contains a Quartz Pendulum Movement with all assembly hardware; a 12" rod and bob: brass hour, minute, and second hands: and assembly instructions. The precision quartz movement is accurate to within 15 seconds per month, and will run for a full year on two AA alkaline batteries. Clarity's Clock Pack is great for your stained glass clock projects! 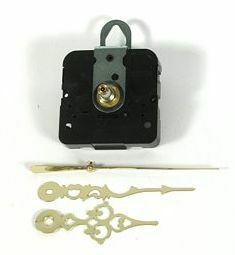 It contains a precision mini-quartz movement accurate to within 15 seconds per month, all assembly hardware, a set of three brass hands, and assembly instructions.